Rainbow Ryan slot is and oddball combination of an Irish theme combined with a heavy rock one, like mixing Netent's Motorhead with Quickspin's Leprechaun Hills for example. 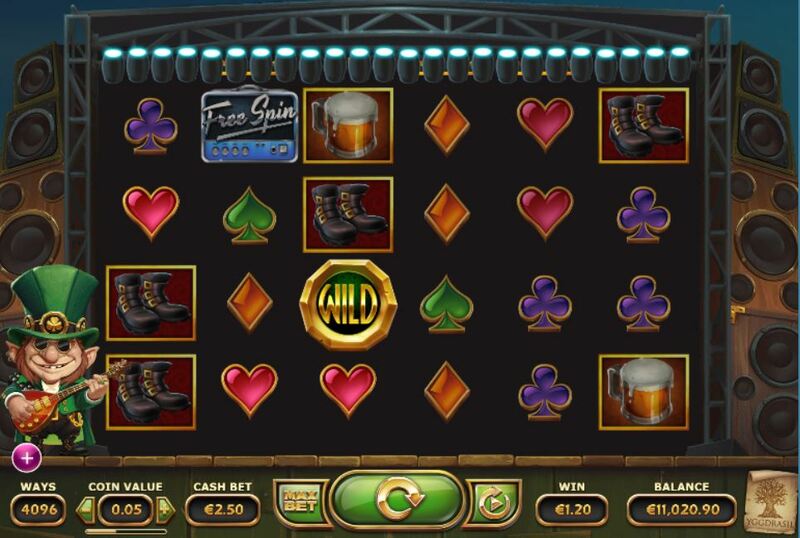 This has been done once before, a developer getting tired of Irish slots and combining the subject with another one as we saw Shamrocker's Eire to Rock from IGT and Play'n Go's Leprechaun Goes Egypt. Here we have the reels set over a stage lined with amps and speakers and listen to a hard guitar riff strummed out by what looks like Ozzy Osbourne dressed in a leprechaun costume to the left of the reels. Can Ryan turn the volume up on our our bankroll, or will it be buried in the mosh pit? For the first time Yggdrasil have brought us a 4096-way game over 6 reels of 4 rows the same format as other games you may have played such as Raging Rhino or Buffalo Blitz. The icons appear both single and stacked in any number up to the 4 rows for the card values, 3 rows for the rest. 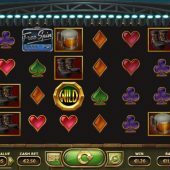 Single Wilds can appear on all reels and so can scatters which trigger a unique free spins rounds as we will shortly discover. The symbols won't pay too much due to the 4096-ways and the Leprechaun's Hat full of coins is best at 2.5x bet for a 5-of-a-kind, the Boots 2x, Microphone 1.5x and Beer at 1x. There are pictorial card suits paying either 70 or 50 coins for the full line thus less than 1x bet. Nothing special so far, but now we can discover Rainbow Ryan's random in-play feature: every now and again when you spin he will play his guitar more aggressively and it will fire Rainbows on to 2 up to 6 reels which will then clone together like Twin Spin. If only 2 reels they are guaranteed to be adjacent, if 3 or more at least 2 will be adjacent. So for example he lights up 4 reels, and you may get 1, 2, 4 and 6 or simply the last 4 reels together - you never know! There are single free spin icons in the form of portable Amplifiers on all reels and you need 3 for 7 free games, 4 for 10, 5 for 15 and all 6 for 20. No retriggers, but you do get a guaranteed Rainbow Reels clone every spin which cannot reduce. This means that when he starts with two adjacent reels, and then say lights a third one up after a few spins then all remaining spins will have at least 3 random reels (2 at least adjacent) until the bonus ends.